Are you ready for Magic: The Gathering to invade Boston? Not only will we be holding the biggest Magic: The Gathering event of all time, the Mythic Invitational, but we are also holding a War of the Spark panel. With sixteen exclusive card reveals, and the debut of the War of the Spark trailer—you better be ready. When and how can I watch? 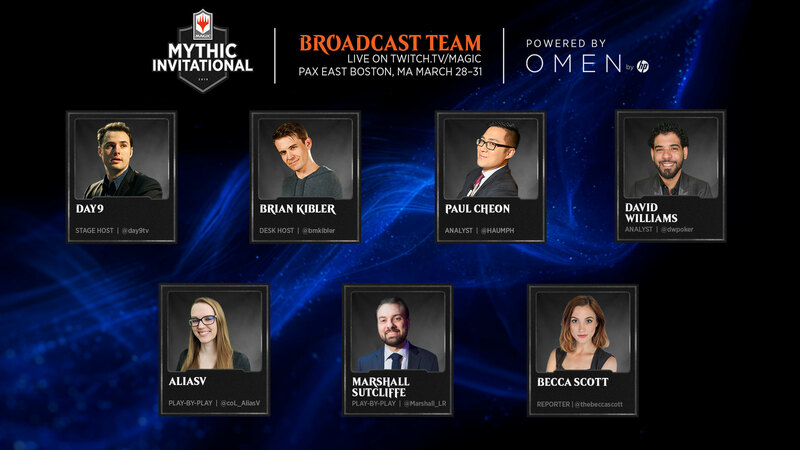 The Mythic Invitational will be broadcast live on twitch.tv/magic beginning at 10 a.m. Thursday through Saturday, and 11:30 a.m. for the Top 4 on Sunday (Eastern US Time). We'll be bringing round-by-round coverage straight to your screen, so tune in all weekend to catch the action! For match-by-match updates, be sure to follow @MagicEsports and @Wizards_Magic on Twitter. Looking for cool behind-the-scenes coverage at the event? Check out our Instagram page! To stay in touch on social media, use the hashtag #MythicInvitational. Who is covering the event? The Mythic Invitational will feature double-elimination play through all days of the tournament, including Sunday, and feature a brand-new format we are calling Duo Standard. In Duo Standard, players will submit two Standard-legal decks. Players will not sideboard between games, though they may submit a sideboard (for cards such as Mastermind's Acquisition). Players can submit two different decks, two decks of the same archetype with different cards in both, or the exact same deck twice. Game 1 – The deck each player uses and who goes first will be randomized. Game 2 – Players will use the deck unused in Game 1, and the player who went second in Game 1 will go first. Game 3 (if necessary) – Each player chooses which of their two decks to play and the player who goes first is determined at random. That War of the Spark panel sounds awesome! What's in it? Great question! Not only will we be showing off the War of the Spark trailer, but we're also going to preview sixteen brand-new cards! If you're at PAX East, you should definitely check out the panel in person. If you aren't in the area though, don't worry—the panel will be streamed live on twitch.tv/magic! The panel will include War of the Spark creative lead Doug Beyer, set design lead Dave Humpherys, and art director Taylor Ingvarsson. Your host will be none other than Jimmy Wong of Game Knights and the Command Zone. If you're going to be in the area for PAX East, you can watch all the action in person! How does the money break down? Players will be competing for $1 million total, including $250,000 for winning the whole thing!